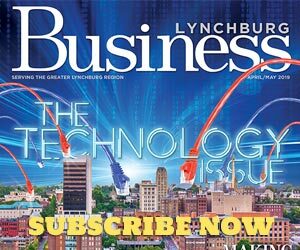 Gary Raulerson of Innovative Wireless Technologies was strolling through the hallways of his company’s headquarters in Downtown Lynchburg during a normal afternoon in June, when he came upon Todd Irby. Raulerson, who serves as operations director at IWT, had somewhat of an urgent message for the company’s COO, though by the tone of his voice it sounded as if the two were chatting about the weather. Raulerson relayed to Irby, who has served as COO for IWT for 14 years, an urgent call from a mine customer in the Appalachian Mountains. IWT was informed that parts of the communication system in this particular mine were down, and without the supplies to reboot the system, the mine would be forced to close per federal regulations spelled out by the Mine Safety and Health Administration. The mine needed additional fixed mesh nodes—wireless underground infrastructure devices that allow miners to communicate with one another— by the next day, but Raulerson had already dispatched an employee to IWT’s field office in Beckley, West Virginia to facilitate the order. In-house repairmen worked at an expedited pace to fix damaged nodes and radio handsets. What the mine surely saw as a shut-down problem was solved without skipping a beat. Irby responded with an easygoing, “thanks,” and continued walking down the hall, talking about IWT’s ability to collaborate and solve the everyday problems as well as the dire—at times life-threatening—hurdles in places where Wi-Fi and cellular connections are not an option. Behind the scenes of many mines, underground tunnels, and watersheds across the country, there exist state-of- the-art communication systems that are engineered and built locally in the heart of Lynchburg. For much of its work in mines and underground communication, IWT sets up a linked system of fixed mesh nodes—self-developed infrastructure devices that when linked together wirelessly, enable voice communication, the collection of data, text messaging, tracking, and atmospheric monitoring sensors. According to Irby, the nodes can be used in hundreds of varying ways that allow coal, aggregate, and other underground miners an advanced flow of efficiency and provide rescue workers at the scenes of mining and other environmental disasters a reliable source of wireless communication. Going beyond mines, IWT has also developed forms of wireless communication through custom engineering and the Internet of Things which has been used for environmental tracking and security for above-ground operations. IWT has been commissioned by the U.S. Departments of Defense, Energy, Labor, and Homeland Security in the past just for starters, and clients range from across the country. For instance, IWT has a system installed in an underground nuclear waste storage facility and another in a major urban tunnel project. Specifically, IWT has been on the forefront of wireless communication across the U.S.-Mexican border for the Department of Homeland Security, and the company is involved with a project with the Department of Energy that uses sensors to track water movement and find contaminants travelling through America’s rivers and streams. Irby, walking throughout the building pointing to detailed plans neatly written on whiteboards and maps of mines that stretch to be 13 miles long—he calls them “underground cities”—also showcased a model of a smart lightbulb. IWT developed it to connect streetlamps through a wireless network that automates the streetlamps to turn on and off while establishing radio communication between the lights. And although IWT receives contracted work from companies and federal agencies that approach the company, Irby noted that, more often than not, IWT knows its business well enough to target potential problems in the mining, security, and commercial industries itself, and then coordinates its engineers to find ways to solve those problems and market them to potential buyers. For being such a multidimensional company, Irby admits that clients do not always first expect that IWT’s headquarters would be in Lynchburg, though the COO later said it makes sense to be located in the area for a number of reasons. IWT formed in 1997 as a spinoff company of GE/Ericsson. After Ericsson’s departure, there was a substantial amount of available talent in hardware and software engineering in the area, and IWT capitalized on that opportunity. 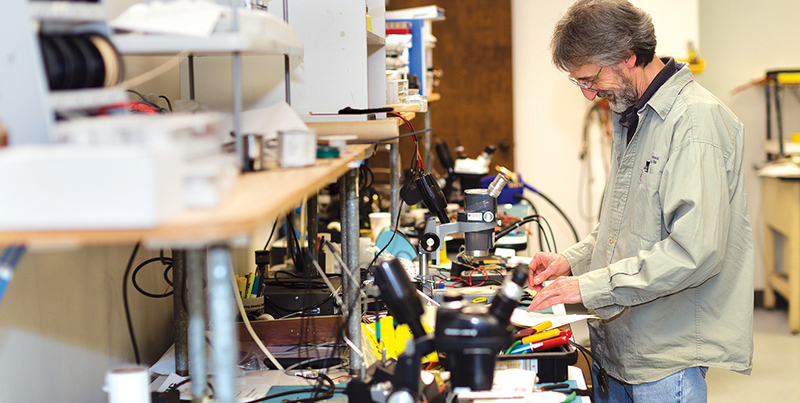 Today, it employs approximately 50 people of varying expertise. Depending on the size or scope of the project, Irby said any given project that IWT works on can take a couple of weeks or years to facilitate. Working on so many different solutions to dynamic and complicated problems ensures that IWT is always engaging with new ideas—Irby said while showcasing the hardware intricacies of one of its nodes that IWT “is a new company every six months,” an overarching philosophy of the company that constantly immerses its employees in new ideas and exciting projects. It was clear walking through the various offices and workbenches of IWT that alongside the company’s purpose in establishing different forms of wireless communication for workers who need it the most, there is a greater sense of community among team members. While greeting and catching up with numerous employees around the company’s headquarters, Irby repeated that in order for the company to handle large and urgent orders and to solve complex problems, that cohesiveness and a sense of company family has to be a top priority. In part because of its dedication toward building a community-driven staff—both inside and outside of the company’s walls—and an inclusive corporate culture, IWT was named one of Lynchburg Business Magazine’s “Best Places to Work” in 2016. 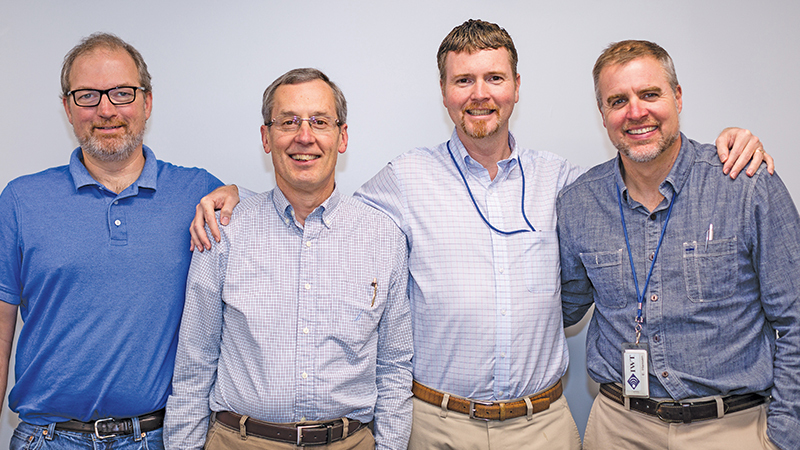 And although Irby said he personally enjoys the work—the creativity, research and flexibility of his job—he said his coworkers not only make IWT a special place to work, but they also make the company an impactful part of the Lynchburg community and the country, as so many people benefit from IWT’s technology without ever realizing it.